The purse is represented by the loop and incomplete bar (with a weight of 15.1g) and is of Ward Perkins (1940, p 168) Type B1. The loop is sub-oval and slightly distorted (with an overall length of 50.3mm and a width near the top of 17.8mm) and converges to its base. There is no surviving decoration at the base of the loop. The shank has been peened over a broad washer (8.9mm diameter), now damaged, at the base to secure it within the central block. The central block is sub-rectangular (16.0mm wide, 9.3mm high and 9.1mm thick). There is the suggestion of an incised chevron decorating the block, now heavily worn and corroded. The incomplete bar was comparatively short (with a surviving width of 39.6mm) and appears to have been decorated with cast ribbed mouldings (with a diameter of 5.3mm). The terminals of the frame are not present but would have been secured by the riveted globular washer. The surface is very heavily corroded with a pale-brown patina and green corrosion. 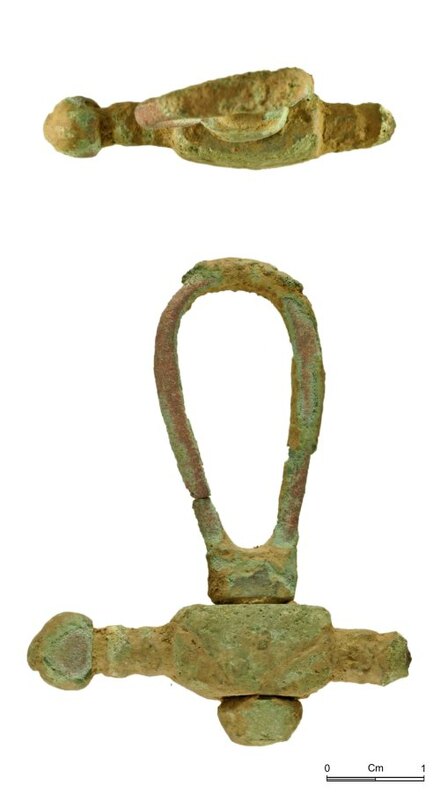 The purse bar corresponds with Ward Perkins Type B1, which he parallels with purse representations on early-to-mid-16th century brasses.